FitnessGram is a comprehensive fitness-assessment battery for youth. It includes a variety of health-related physical fitness tests designed to assess aerobic capacity, muscular strength, muscular endurance, flexibility, and body composition. It is extremely important that students understand why they are taking part in the FitnessGram assessment. This understanding entails teaching what the FitnessGram assessment measures and why it holds value. Strength and endurance of the abdominal muscles are important in promoting good posture and correct pelvic alignment, the latter of which is particularly important to low-back health. In testing and training the muscles of this region, it is difficult to isolate specific abdominal muscles. 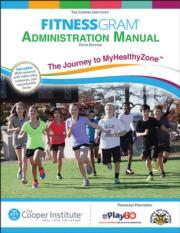 With the fifth edition of FitnessGram Administration Manual: The Journey to MyHealthyZone, K-12 teachers can conduct, record, interpret, and share results for numerous health-related fitness assessments. They can create personalized reports for students and document outcomes in the five components of health-related fitness. You will learn how to administer the tests, interpret the results, and provide feedback to your students on their results. FitnessGram Administration Manual also offers a web resource that includes video clips that demonstrate the assessments; audio for the PACER, curl-up, and push-up tests; and reproducible forms. Several test options are provided for most of those areas; one test item is recommended. This latest version of the FitnessGram Administration Manual: The Journey to MyHealthyZone is your guide to conducting the test protocols, recording the data, interpreting the results, and sharing those results in ways that will encourage students to be physically active and adopt healthy behaviors throughout their lives. Resource for K-12 physical educators and undergraduate physical education teaching methods courses. The Cooper Institute is dedicated to promoting lifelong health and wellness worldwide through research and education. Founded by Kenneth H. Cooper, MD, MPH, The Cooper Institute translates the latest scientific findings into proactive solutions that improve population health. Key areas of focus are research, advocacy, adult education, and youth programs. Through these initiatives, The Cooper Institute will continue to help people lead better, longer lives now and well into the future. For more information, visit CooperInstitute.org. FitnessGram assesses youth health-related fitness and delivers personalized reports to students and parents. Developed by The Cooper Institute, FitnessGram was adopted by the Presidential Youth Fitness Program in 2012 and is used in schools nationwide. It serves as a student-centered assessment, reporting, and educational tool used in promoting health, fitness, and activity in children. The book includes a web resource with video clips; audio for cadences in PACER, curl-up, and push-up tests; and reproducible forms. All ancillary materials for this text are free to course adopters and available online at www.humankinetics.com/fitnessgramadministrationmanual5E.